Another Columbia Sportswear animation done in Cinema 4d, and rendered in Vray. This was a modeling challenge. The sheer number of polygons on this boot is out of control. Here’s an animation we did last year for Columbia Sportswear. Rendered in Cinema 4d using AR. Water simulation done in RealFlow. 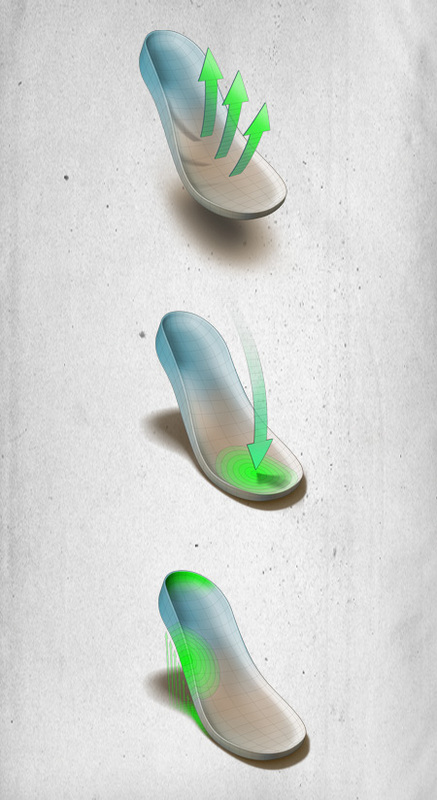 Columbia Omni-Tech 3d Fabric Animation from sketchbookinc on Vimeo. Recently finished up another project for Columbia. 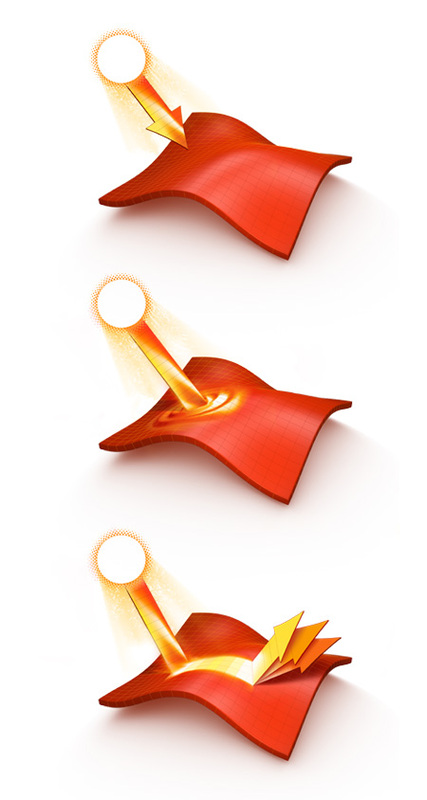 They asked me to animate the 3 fabric technology illustrations I worked on recently. The animation was extremely easy for the most part – with the exception of the RealFlow simulations I created. I spent weeks on this – as I am definitely no RealFlow expert. I have been learning as I go, and am amazed as much as I am frustrated by this program. I need it from time to time, and was using a contractor to create the realflow elements in my animations. At some point I realized it would be best to buy the program and learn it for myself. So for the Columbia animations, I had to create several simulations. The first, and most challenging, was rain pounding on the fabric and running off the edge. It’s tough enough getting one stream of fluid doing what you want – but even tougher to get hundreds of little rain droplets behaving. The toughest part of RF is getting the water to take on the properties of real water. Sounds like something that would be built into the program right? I mean, if you have a scale object with real world units inside the program, you should be able create “real world” behaving water right? Nope. You have to build your water from about 2 dozen individual characteristics. Viscosity, density, internal pressure, external pressure, etc. And beyond the fluid properties, you have about a dozen different settings for the mesh which builds around the particles which RF uses during simulation. This is your fluid actually – particles. The mesh is what you render in your 3d application. In the end I had to look up a custom script which changes the properties of the fluid upon contact with another object. So for the Fabric animation, the rain would come down, and I would swap out each particle at the precise moment that the particle collides with the fabric. You can then add different settings to this second fluid, so that your splash could be more like what you were hoping for. I thank Dan at Columbia for pressing me for a better looking simulation as I went along. My rain was looking like bb’s for a while. My second simulation involved creating a very viscous fluid like syrup interacting with the material. Not quite as difficult, but definitely a challenge. 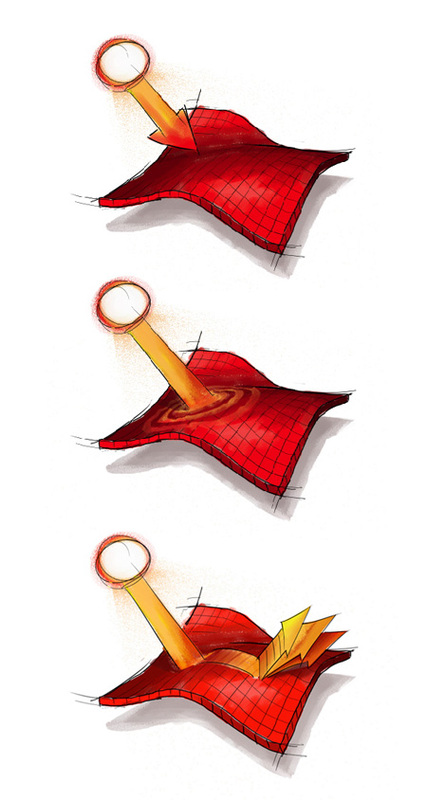 This particular simulation also involved a lot of tweaking with the fabric properties. As if all the other properties weren’t enough! Lastly, I worked on several simulations for moisture particles which move up off the body and up through the fabric. This was a pretty fun simulation actually, but in the end we didn’t end up utilizing it. Just way too complex. RealFlow has gas particles, which act differently than fluid particles, and this is what I used for the simulation. I utilized an emitter under the fabric and had hundreds of particles rise until they encountered the fabric – at which point they would collect under the surface. After a time, they would pass up and through the fabric, which created a neat looking animation. Tough part was that we had to work with the illustration which we had created originally, which shows 3 fabric layers pulled apart from each other. So if you are to simulate gas (moisture) going up and through the fabric, which layer does it interact with? The middle layer is the layer which performs all the magic, but do you just ignore the other layers? Ideally this animation would be good if it were done on a non-separated section of cloth. Otherwise it becomes too complex – which it did. I look forward to posting these animations soon. 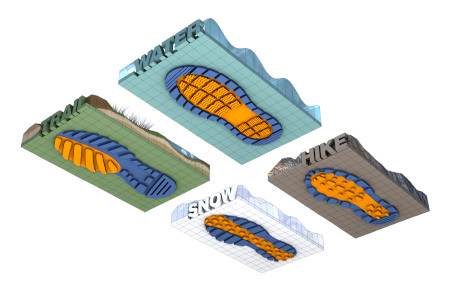 My second project with Columbia involves creating a 3d animation of the Bugaboot – Columbia’s premier winter boot. 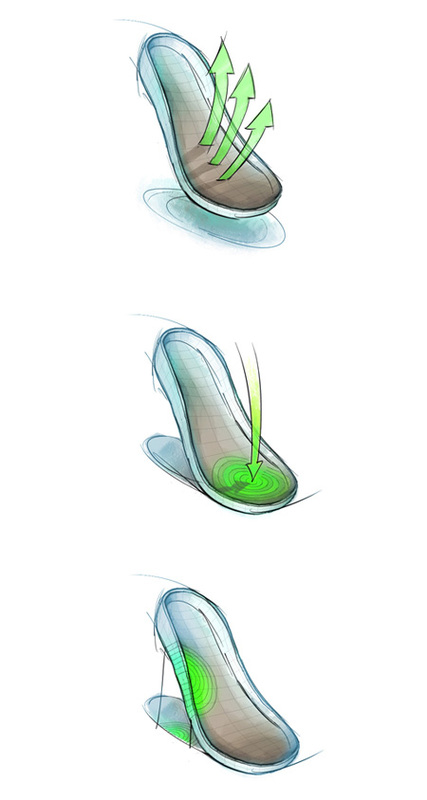 I can’t speak about the specifics of the animation nor the boot due to NDA, but I can speak some of the complexity of this 3d boot’s creation. Columbia gave us a sample boot as reference, and we modeled everything from scratch, including an insanely complex tread. Wild. 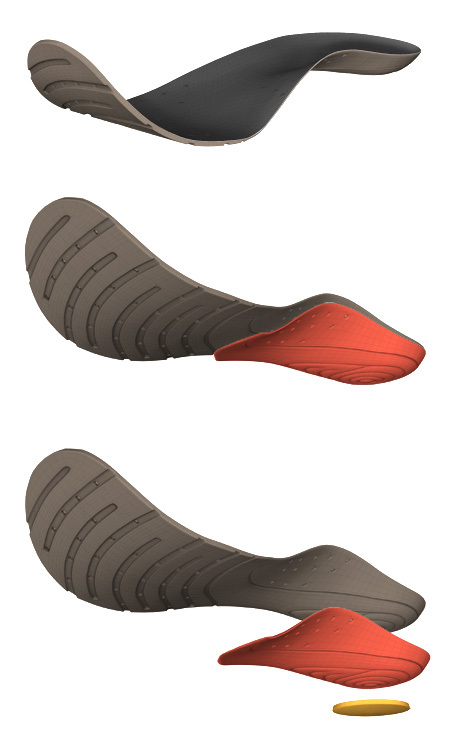 Wish the animation was a little more complex, as the detail in this shoe will never be seen at the resolution we rendered at. I’ll have to do some rendering on my own of some close-ups. This boot looks absolutely real. I don’t have it in front of me but the boot geometry alone was hundreds of thousands of polygons, and that’s before any type of smoothing. The tread alone was around 50k polys. Sadly, Vray had a bug with bump and displacement maps when using UV coordinates, so I am glad the boot is fairly small in the frame of the animation. Vray 1.1 for c4d is now out, and we will have the ability to really improve on this. Not to mention 64 bit rendering, which will handle the millions of polygon’s without blinking. I will post images as soon as I this boot hits market.